My mother was given this antique Tiffany-like hanging chandelier. It was converted from oil to electric and is at least 70 years old. There are no markings on it that I can find. If it were a real Tiffany lamp it would have markings. If it has no markings it will be difficult to identify and give a value. You can try taking the pictures to a dealer. It is a really pretty piece!! How lovely to have had something so beautiful in your family for so long. There may be markings that a dealer can find since they know what to look for. Lamps are not my specialty (though I like them), but I do know that markings can be quite subtle and often you need a magnifier to see them, especially in something so old where it may be in a place that had a lot of wear (like on the metal). Since you know some history of the piece, I suggest finding a good antique/vintage dealer who is local and taking the piece--or lots of photos and having them help ID and value it. Value is dependent on so many things with pieces like this--glass condition, metal condition, working status, and of course, supply and demand for your area. If there is a low supply, and high demand you can often fetch decent money, than if there was a huge supply and low demand which drives prices down. I would never sell a piece like this online since it is too fragile and heavy which offers two strikes against a successful shipment. 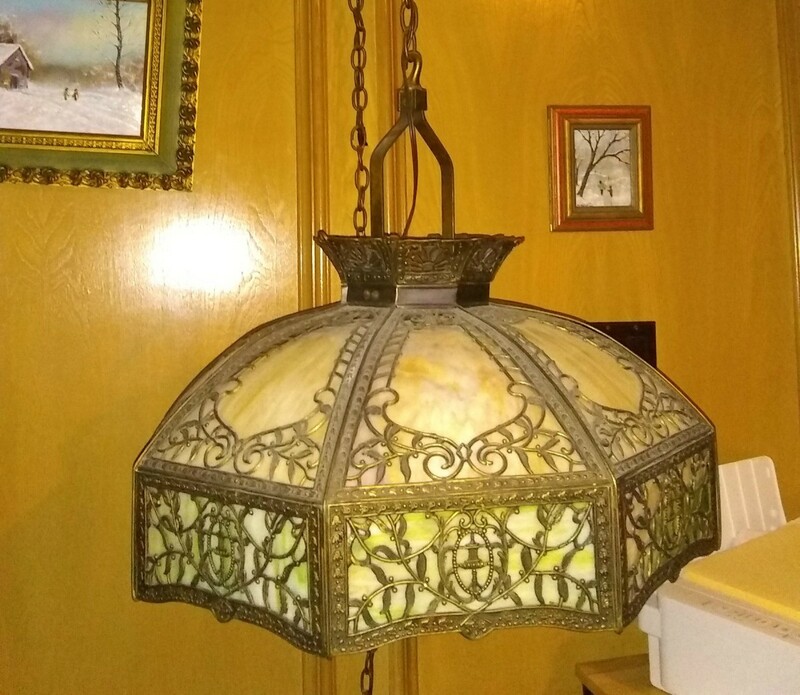 For selling I would recommend doing it through a reputable dealer or consignment shop--where you are comfortable with the percentage they give you for the sale and where they can showcase the piece--like by having it lit and displayed in a place where the sun can help show its beauty. If the value (as determined by the dealer) is less than $50, you can try to sell it yourself on Facebook Marketplace, LetGo, or Nextdoor and see if you get any nibbles that way (that way you pay no commission and keep the profits). These sales are a challenge with a lot of no shows and people haggling over the prices, so it is not for the faint of heart, so to speak. I have made some bigger sales this way recently, but I have been doing this for a long time and have a reputation in my area for being honest and trustworthy. Many people do not want to pay a lot of money when buying from strangers, so that can be a challenge also. Post back what you learn and share with me so I can learn more about your lovely light!! Blessings to all! Your statement is not very clear as to how long this has been in your family so it is difficult to tell how you know that it is "at least 70 years old". Without solid provenance it is difficult to date something like this (no markings). Trying to place a value on an item like this is truly difficult unless you are an expert in the field. I can see several things that may lower the value and without a lot of pictures there may be things that cannot be seen from these. 1.) 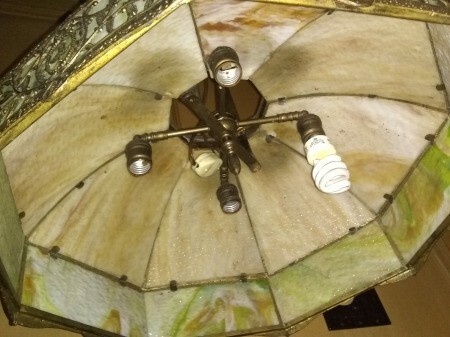 Most chandeliers - at least part of the time - are "seen" from the bottom/underneath and this one looks pretty modern and is not all that nice looking. 2.) From picture it appears there are several clamps missing and there appears (?) to be damage to the rim. Some of this can be repaired but may be expensive and may also be difficult to find an artist/repairer in the area. If clamps are missing it usually means some of the soldering may be gone also which may loosen some of the panels. 3.) Converted pieces are rarely as valuable as the original item. I am by no means an expert on any of this but I love these old lamps so I know what I look for and also what causes the price to be high or low. You can look at some of the similar lamps listed for sale so you can get an idea of how the sellers are displaying and describing their items. 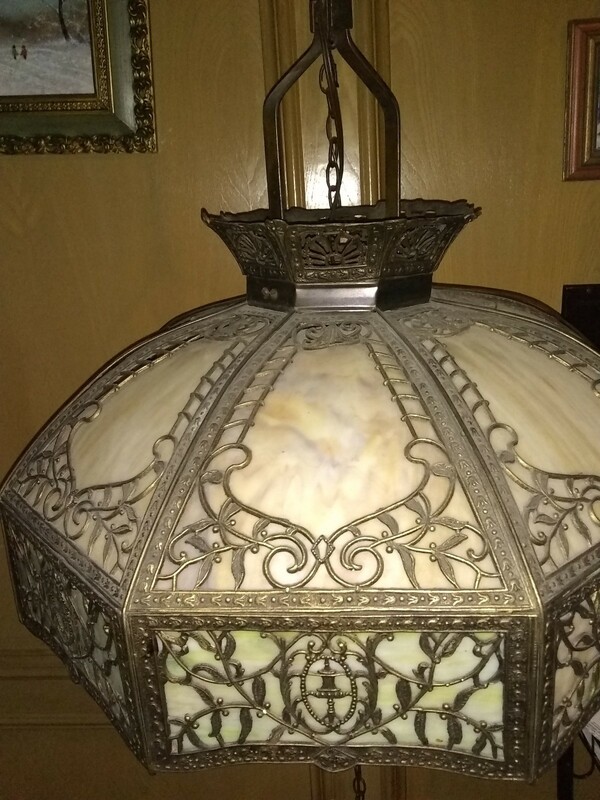 Only real identical sold items can give you any real current value and you will most likely never find anything even close to your lamp (especially converted from gas). On site appraisals are usually expensive and rarely can a true expert be found unless you live in a very large metropolis. You can ask for an online free appraisal but you will have to present several pictures (and several closeups of the metal work and any flaws) as well as a good description (size) and all information you have on provenance including the city it was found in. I hope it is valuable.